A little busier this weekend, but week two is now done and dusted. Two wins from four games is not to be sneezed. January is finally over and we’ve loads to look forward to in February. But let’s get you up top speed on the Inter County Results from this weekend. Dublin’s Senior Ladies suffered their first defeat since March of last year, as Donegal took the spoils from Croke Park last night. Karen Guthrie produced an outstanding performance for Donegal giving her side the opening round win. Donegal’s defensive play worked in their favour. And Guthrie and Geraldine McLaughlin were continuously dangerous in possession. That kept Maxi Curran’s side in the driving seat for most of the game. Niamh McEvoy, Carla Rowe (2), Aoife Kane and Siobhan Killeen were all on target for Dublin in the first half. But Guthrie’s goal was the difference between the side at 1-05 to 0-05 at the break. Nicole Owens got Dublin back up and running in the second half with two scores, but Donegal were bubbling to boiling point. McLaughlin recorded three without reply to extend their lead to 0-06. Lyndsey Davey was despatched from the Dublin bench. And her introduction saw her make an immediate impact, sending the ball past Aislin Nee and into the goal. But Donegal’s discipline in defence never faltered and they ran out the victors. Last week’s defeat to Monaghan in Clones was certainly buried. Jim Gavin’s Dublin panel showed they still mean business with an 0-11 victory over Galway. Dean Rock’s 57th minute goal put this tie to bed, pushing Dublin out to an 0-08 lead. The boys in blue have still a long way to go before they reach their peak. But they are showing sure signs that they’re serious about dominating for another year. Player of the Match winner Cormac Costello put in a massive shout for regular starting position tonight scoring five from play and one from an advance mark. Rock’s 1-05 added to the powerful performance, with Dublin recording their biggest winning margin over the Tribesmen in their last four meetings. We saw league debut starts for Liam Flatman and Sean Bugler. And the much talked about Darren Gavin made an appearance in the second half. Paul Flynn was introduced to the action and he dropped a ball in deep, with Rock stunning Galway keeper Ruairí Lavelle to turn and bury the ball into the roof of the net. 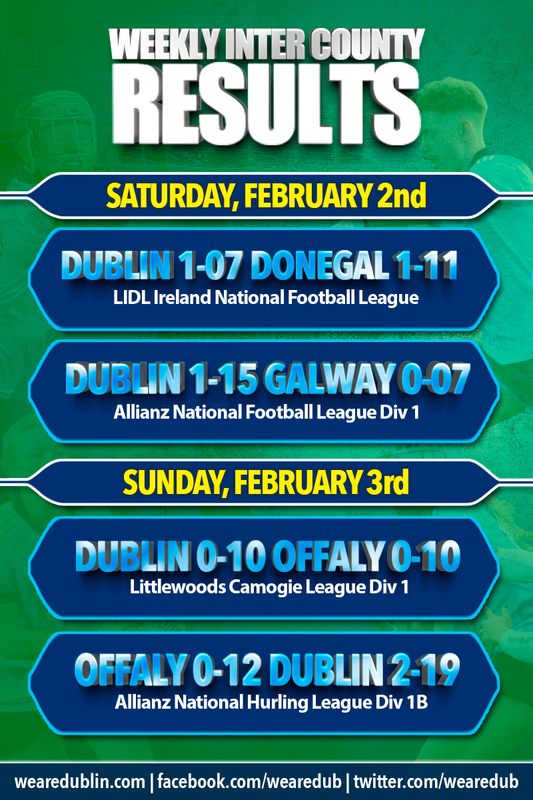 Dublin registered their first points in the league table before they make the trip to Kerry next weekend. While everyone hoped for a win this afternoon, the Dublin Senior Camogie Panel played out a draw in Parnells against a battling Offaly side. From the throw in Dublin showed the aggression they displayed against Kilkenny, but in very windy condition and a soft surface both sides struggled to find form and consistency. Ali Maguire was on target with five frees out of Dublin’s 0-10, with Faughs/Celtic newcomer Kerrie Finnegan scoring a point in either half and showing massive potential to give Frank Browne and his team something to think about. Offaly’s Mairead Teehan was on target seven times for her side today and the sides were pretty much neck and neck for the entire game. 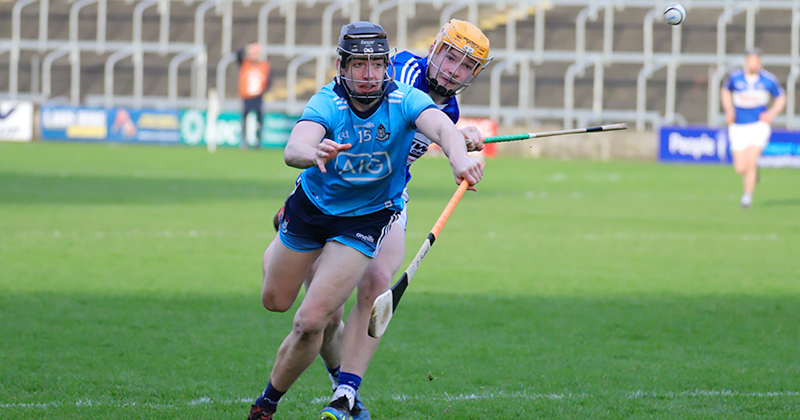 Dublin held a slender lender lead at half time going in 0-06 to 0-05 ahead, but after a score from either side at the beginning of the second half, Teehan scored three unanswered to give the Faithful a two score lead with nine minutes remaining. Ali Maguire scored another free and Kerri Finnegan registered her second to draw the game level again. Maguire got Dublin’s tenth score but they couldn’t keep the lead as Teehan appropriately converted a late free to tie the game. Bord Na Mona O’Connor Park, Tullamore. Round 2 and a second win for the Dublin Senior Hurlers. An inspired 2-03 from Oisin O’Rorke bolstered the Dubs attack this afternoon, with Donal Burke again putting in a huge shift. Burke scored 0-06 himself and gave an assist for one of Dublin’s goals. Offaly, still reeling from last week’s trouncing by Waterford, fought proudly. But the result was always inevitable. The Faithful dug deep in the early stages of the second half, but Dublin refused to let their lead slip and comfortably eased to victory. Mattie Kenny made some late changes adding Oisín O’Rorke, David Treacy, Danny Sutcliffe and Seán Treacy to the starting 15. And the changes made a huge difference, particularly Oisin O’Rorke’s first class performance. Despite losing Liam Rushe to injury Dublin were worth the entrance fee today. John Hetherton and Fergal Whitely were introduced to the action and added 0-05 between them. So the boys in blue sit joint first in the table with Waterford, as Galway only drew this afternoon with Carlow in Netwatch Cullen Park. Dublin have two weeks to prepare for their trip to Pearse Stadium for Round 3. And that’s it. A slightly quieter time next weekend, with Jim Gavin’s footballers heading to Tralee on Saturday and the Dublin Senior Ladies making their way to Tipperary on Sunday. We’ll bring you all the details on both games soon.